Protier offer a complete range of Genie Material handling equipment for hire, including the GenieSuperlift Advantage (SLA), the Superlift Counterbalance (SLK) and the Superlift Contractor (SLC). 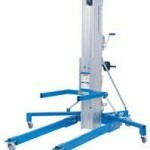 These products offer a capacity of up to 454KG and up to a maximum lift height of 7.9m (25ft). Models: SLA5, SLA10, SLA15, SLA20, SLA25, SLC or SLK. 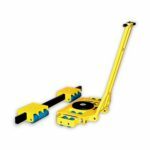 Optional items for use with this product include a Material Lifting Boom, Material Lift Pipe Cradle, Material Lift Fork Extensions and Material Lift Load Plate. 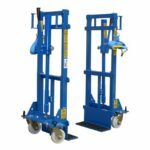 The Skoot system from BIL Materials Handling offer a portable lightweight moving systems which hydraulically lift loads of up to 5 Tonnes (5000KG) capacity, off the floor on to castors allowing easy movement in any direction. For heavy and bulky loads of any size or shape Skoots are chosen by a wide range of industries to handle a diverse range of applications. Yale SX Machinery Movement Skates are the leading Nylon Skate System available. Designed for safely transporting heavy or bulky loads. Featuring a robust lead skate with turn table and a pair of rear trailing skates in standard layout, but multiple sets can be used to carry abnormal loads. Available in capacities of 10,000KG, 20,000KG, 30,000KG, 60,000KG, 100,000KG. 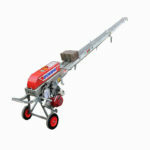 The Bumpa hoist is a revolutionary way of transporting Tiles, Slates & Bricks up to roof level. Easy to transport, the Bumpa can be erected and up and running in minutes. It can also be reversed to allow the removal of tiles from roof level.